Download this high velocity multiplayer snail racing game with lots of unique racing snail shells to race with and lots of super cool power ups. Download it now. Tiny Turbo Snails is where you can either race against friends to beat 35 unique levels or go against the computer. This snail racing game is simple, yet addictive one button game play to speed up your snail through rough and slippery terrain. 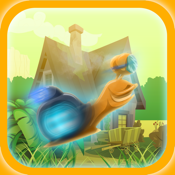 Collect new snail shells that help you race through your friends best time online.